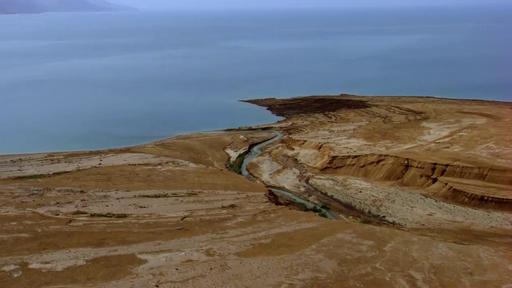 River Jordan draining into the Dead Sea. As discussed earlier, all water resources in Palestine are shared, mainly with Israel. Shared water usually needs to be governed through agreements on allocation and use between the different parties. The first attempt after the UN partition declaration in 1947 to resolve shared regional water issues was the Johnston Plan of 1955. Mediated and supported by the United States, it attempted to allocate all water resources in the Jordan River Basin among the countries that shared the basin at the time: Israel, Lebanon, Jordan and Syria. The agreement stated that 55% of available water in the basin should go to Jordan (which at that time included the Palestinian West Bank), 26% to Israel, 9% to Syria and 9% to Lebanon. The Johnston Plan was accepted by the technical committees of the riparian countries but has never been ratified. The waters of the Jordan River have since been exploited by unilateral projects without any compliance with the water allocations that were proposed. Equitable utilization of joint water resources in and beyond the interim period. Israel recognizes Palestinian water rights in the West Bank. These rights will be negotiated in the final status negotiations and settled in the Permanent Status Agreement relating to the various water resources. Israel will transfer to the Palestinians the powers and responsibilities in the sphere of water and sewage in the West Bank that are related solely to Palestinians, and that are currently held by the military government and its Civil Administration. This transfer will not pertain to issues that will be negotiated in the final status negotiations. The issue of ownership of water and sewage-related infrastructure in the West Bank will be addressed in the final status negotiations. The future needs of the Palestinians in the West Bank are estimated to be 70-80 MCM/yr. The immediate need of the Palestinians for fresh water for domestic use during the interim period is about 28.6 MCM/yr (23.5 MCM/yr for the West Bank and 5.1 MCM/yr for Gaza. Of the West Bank increment of 23.6 MCM/yr, 20.5 MCM/yr has to come from additional wells and 3.1 MCM/yr from Mekorot). Palestinian water specialists criticized the Oslo II Accord because it did not deal with the Palestinian water share of the Jordan River, the shared Western and North-Eastern basins of the Mountain Aquifer, nor with a reduction in Israeli water consumption from Palestinian water resources or the quantities provided to the illegal Jewish settlers in Palestine. Moreover, the agreement ignored the issue of equitable and reasonable distribution of the available water resources. Accordingly, the inequitable division of the shared aquifer systems was maintained, with the same 80% allocated to Israel and 20% allocated to the Palestinians. The Oslo agreement was intended to be revised within a five-year period as part of the final status negotiations, but 20 years on, it still governs the water sector. It is worth mentioning that the Oslo Accords applied (and still apply) only to water resources within the boundaries of the West Bank as defined by the “Green Line”. Water resources lying outside of this line, including a significant part of the Mountain Aquifer, are unilaterally managed by Israel and are not limited by the Oslo Accords framework in terms of the amount of water that can be extracted annually. 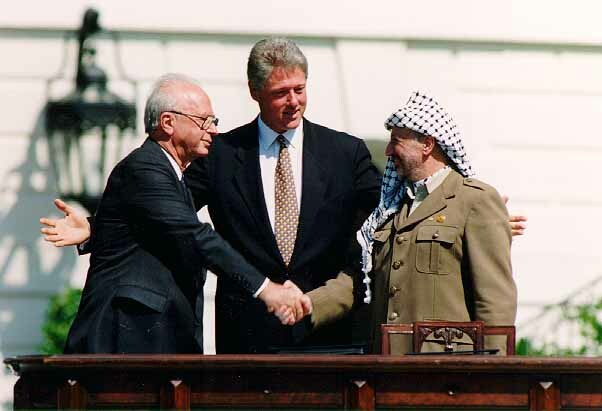 Clinton, Yitzhak Rabin and Yasser Arafat during the Oslo Accords on September 13, 1993. By Vince Musi / The White House.